The IODP expedition that began in April in the Gulf of Mexico is kicking off its onshore phase today in Bremen. IODP Expedition 364 Chicxulub K-Pg Impact Crater was the first time scientists drilled the Chicxulub Crater (the crater from the asteroid impact that 66 million years ago wiped out 75% of life on Earth, including the non-avian dinosaurs) from sea. For the Chicxulub Impact Crater expedition, the Liftboat Myrtle was leased, and then customized to allow it to act as a drilling ship (you can learn more about the Liftboat Myrtle here). The Liftboat Myrtle was not big enough to set-up all the lab spaces and equipment necessary to do core description, though. That had to wait until the day the cores and scientists could all join together onshore. That day is actually now. Starting September 21st, the entire Chicxulub science party came together to meet in Bremen, Germany for four weeks to describe and analyze the cores from the Chicxulub Crater. Why did they come to Bremen when there are so may other interesting places to go, like the Canary Islands or Delaware? Is it because it is the home of this interesting statue? 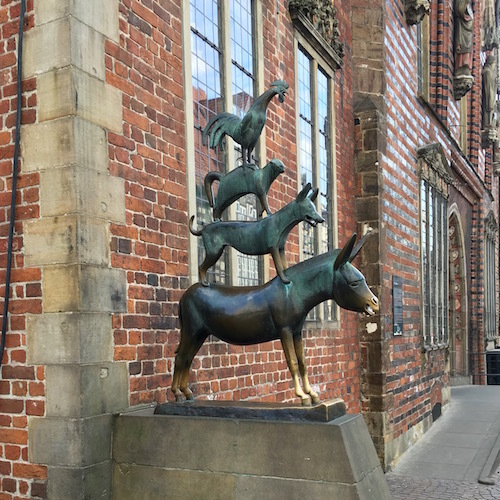 Maybe a little, but Bremen was picked almost entirely because it is the home of the University of Bremen, which in turn is the home to one of the IODP’s three core repositories. The Bremen core repository is where the Chicxulub Crater cores have been living and kept preserved ever since they came onshore. The University of Bremen is also the home of MARUM (MARUM’s name in German creates the acronym MARUM, but in English it translates as Center for Marine Environmental Studies). MARUM’s laboratories have been set-up with the same lab instruments and equipment found on the JOIDES Resolution, so everything is already here that is necessary to do core description. Because of this, MARUM is the dedicated site for the onshore core description after IODP mission-specific platform expeditions. I will also be at MARUM for the next two weeks to share the Chicxulub Crater Core experience with you. You can follow along at this blog and on the JR Facebook and Twitter pages (Since there is also a JOIDES Resolution expedition happening at the same time, I will be identifying all Expedition 364 Chicxulub K-Pg Impact Crater expedition cores with the hashtag #364DinoCrater).